Far Cry: New Dawn is something of a paradox. On the one hand it’s exactly what the series needed, a significant mechanical shakeup that’s breathed life into ideas that grew stale two or three entries back. There’s complexity, here. Friction, you might say. Much of what you’re doing is the same as it was in Far Cry 5, which itself isn’t all that far removed from Far Cry 4 or even 3. But New Dawn remixes features or adds layers on top that force the player to engage with the world more—and it mostly works. But for all its mechanical strengths, New Dawn is further evidence of a series adrift. Ubisoft just can’t seem to decide whether Far Cry is over-the-top silly or deadly serious, and New Dawn falls into the same awkward no-man’s-land as its predecessor. I’ll restate it again, just for posterity: Discussing New Dawn means spoiling the end of Far Cry 5. That’s just how it is. I’m honestly not sure why I bother with the warning because Ubisoft’s already spoiled the ending of Far Cry 5 in every bit of New Dawn marketing, but if you want that to stay a surprise? Stop reading. For those sticking around, I assume you either saw (or read about) the ending of Far Cry 5 or, more likely, don’t care. If you’re in the latter group, it’s just about the most absurd—and unearned—ending I’ve seen in recent years. After killing cultists and preppers for 20 or 30 hours you’re treated to a scene where nuclear bombs fall on Montana, proving the cultists and preppers right. Far Cry 5 ends with you and cult leader Joseph Seed alone in the bunker where you started the game, waiting out the apocalypse. 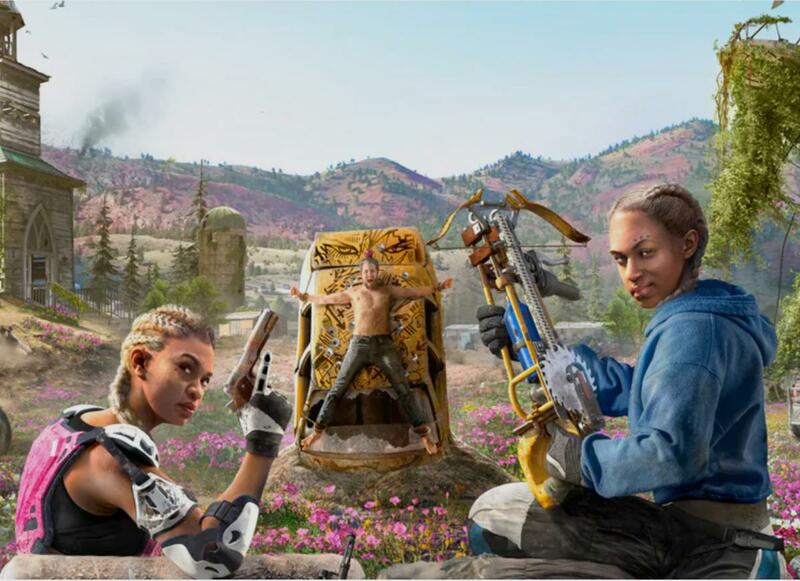 Far Cry: New Dawn is a direct sequel, albeit with a new protagonist. Set 17 years after the bombs fell, Montana’s returned to some semblance of post-apocalyptic normalcy, meaning people are back above ground and building towns. Oh, and wouldn’t you know it, there are people who want to ruin it. They’re the Highwaymen, a group that as far as I can tell loves motocross helmets, the color pink, and club music. 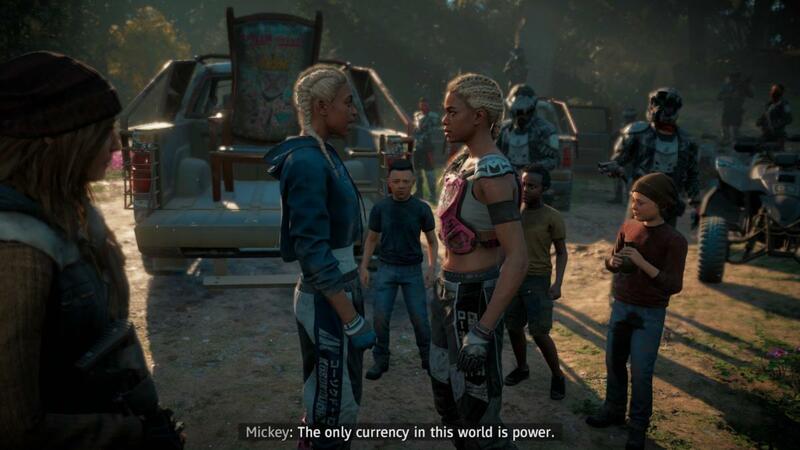 At the top are two of the most generic villains you can imagine, sisters Mickey and Lou, who don’t do much of anything except talk about how “The only currency in this world is power” and so forth. One day Far Cry will feature a big bad that’s not just a thinly disguised take on Far Cry 3’s Vaas, but New Dawn isn’t the one to break from tradition. Anyway, somehow these two YouTube libertarians have enlisted an entire nationwide network of dirt bike enthusiasts—seriously, the Highwaymen control territory from San Francisco all the way down to Florida. And yet they’ve come to Montana, to terrorize the 30-odd people left living there in some ramshackle little town called Prosperity. Then you come to Montana as well, apparently to help liberate these 30-odd people from the Highwaymen. Listen, I’m no four-star general. I have not trained in the finest military academies, nor have I helped rebuild our country after nuclear missiles wiped out the majority of the populace. 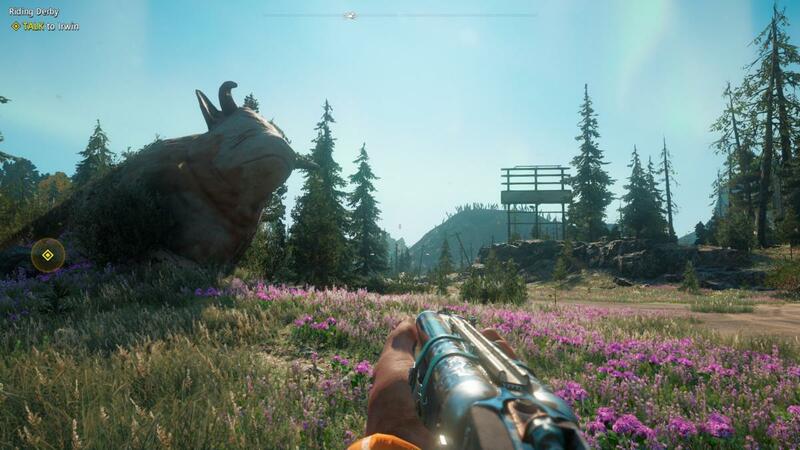 That said, I struggle to understand the tactical importance of Hope County, Montana, a place that in Far Cry 5 was known for bull testicles, wheat farms, and maybe small game hunting. You know what though? If that were the entire story, it’d be fine. Not great, mind you, but it’s a decent enough setup for Far-Cry-in-the-post-apocalypse. Resource scrounging, outposts, all of that makes sense. Ignore the story and go about your business, right? Far Cry: New Dawn isn’t content with a nothing-story though, and that’s where it goes wrong. You thought the ending of Far Cry 5 was wild? Just wait until you get into the meat of New Dawn’s story, which revisits Joseph Seed and the New Eden cult in ways that defy explanation. And in ways that, frankly, I don’t know how to feel about. Like Far Cry 5, I finished New Dawn and just felt bewildered, like “What the hell did I just play?” bewildered. And to some extent that’s refreshing, playing something weird and risqué—but it never really goes far enough to feel like Ubisoft’s in on the joke. New Dawn oscillates between wink-nod silliness and dead seriousness in a way that’s disorienting and even unsettling at times, and I came away feeling the same as I did last time: Ubisoft needs to choose. It either needs to go full Blood Dragon or full Far Cry 2 realism again, but this uncomfortable gray area between earnest and flippant is (at least for me) unsustainable. That said, New Dawn makes great strides around the edges of the story. It’s the second major overhaul in as many years, given that Far Cry 5 already made quite a few changes to the old formula, i.e. having the player discover locations in a more organic way instead of littering the map with icons, adding light puzzle elements with “Treasure Hunts,” adding AI companions, and so on. New Dawn is even more substantial, I think. The key to it all? Tiered loot. It’s a simpler system than Destiny or, in Ubisoft’s case, The Division and Assassin’s Creed. Those games all have complicated and granular gear systems with like, 350 different levels of knee pad armor or whatever. 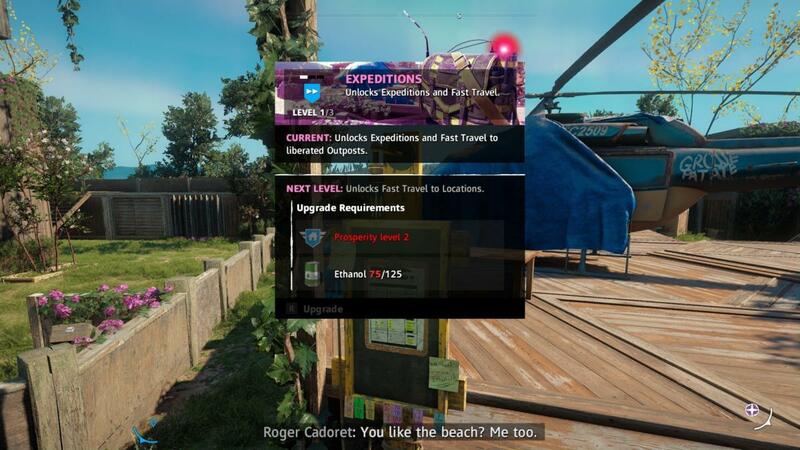 Far Cry’s version is just four tiers, and it only applies to guns. But that’s four more tiers than Far Cry had before, and it makes a huge difference. In the past you basically (if you were like me) bought your favorite weapons two or three hours into the game, then used those same weapons for the next 20-odd hours with zero improvements or incentive to change. For me that always meant getting the bow and the silenced sniper rifle, then wiping outposts from the relative safety of a distant bush. Far Cry: New Dawn still reaches that point eventually, but it takes a few more hours. You start your journey into Hope County restricted to the lowest tier of guns, most of which are like “Rusty Shotgun,” “Rusty Pistol,” and so on. Damage is low, stability is even lower, and most have junk iron sights or other significant drawbacks. Only one or two weapons are viable for stealth kills, and none of them are distance weapons. Worse, a Tier 1 weapon does barely any damage to Tier 2 enemies. To take them out effectively you’ll need Tier 2 weapons. Gaining access to the next tier requires upgrading your base’s weapons workshop. Upgrading your weapon’s workshop requires ethanol. Attaining ethanol requires conquering outposts. Conquering the more difficult outposts means getting better weapons. See the feedback loop? So anyway, you go out and conquer two or three outposts and upgrade your workshop. Then, because this is the post-apocalypse, you need to craft better weapons. This requires scouring the world for springs, gears, and other bits and bobs. They’re all pretty easy to find, and by the end of the game I had a comically large surplus, but it’s one more layer of friction between you and a better arsenal. This loop runs two more times, as you eventually upgrade to Tier 3 and finally Tier 4 weapons, each time doing more damage, getting access to better scopes and silencers and so on. It takes a while though, and in the meantime you might actually use a couple of guns you might otherwise avoid. I used shotguns a lot in New Dawn, because even a lower-tier shotgun could still do decent damage to a higher-tier enemy. And every few hours I got new (and often better-looking) weapons, which made me feel like I’d progressed more than I ever did in Far Cry 5. And you’re not just upgrading weapons. You’re upgrading an entire base, the town of Prosperity. Upgrading your infirmary grants a health bonus, your garage adds better vehicles, your helipad allows fast travel, and so on. All this requires ethanol as well, and eventually you’ll need to “Ransom” your outposts—trade them back to the enemy, who populates the outpost with more and better soldiers. Conquer them again and you’ll get more ethanol, with each outpost featuring three increasingly difficult setups. It’s a cool idea, one that makes outposts a lot more interesting (and a little more challenging) than they’ve been in the past, and adds a good chunk of time onto what’s otherwise a fairly tight, 10 to 15 hour game. Even better are the Expeditions though. 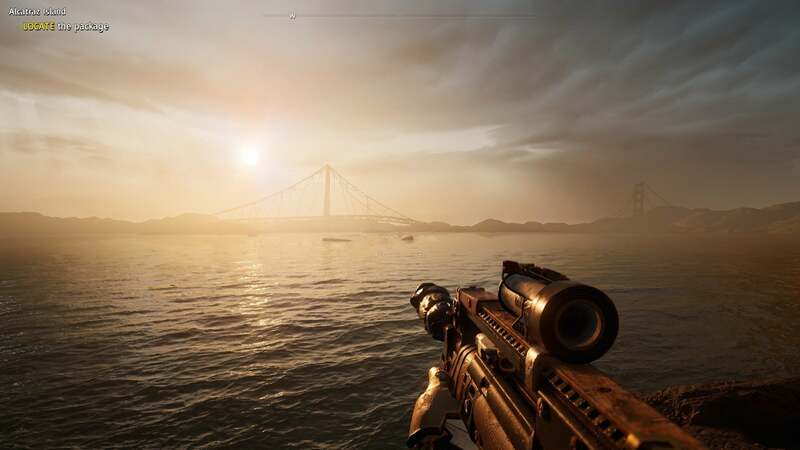 These are basically super-outposts, custom maps built around U.S. landmarks and populated by a ton of enemies. Your goal is to get in, grab a package, and then wait for the helicopter to extract you and your partner while waves of enemies descend on your position. 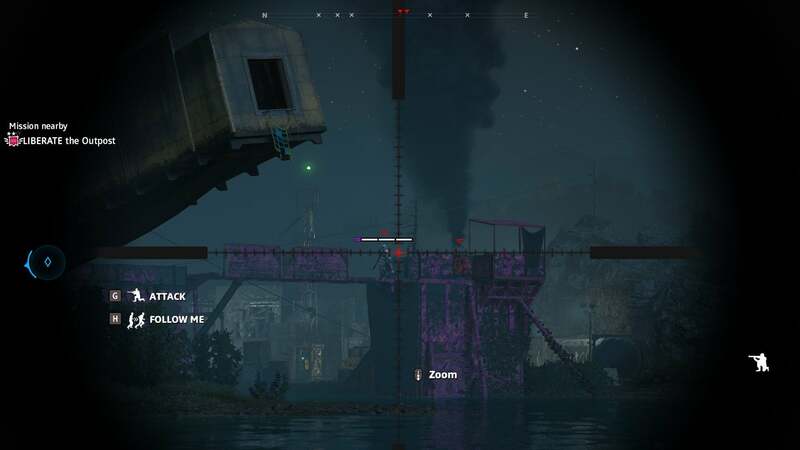 It’s the most exciting Far Cry’s felt to me in a long while, manning a gun emplacement outside Alcatraz or a deserted Louisiana amusement park while keeping an eye on the extraction timer. And it’s also the best part of New Dawn’s post-apocalypse, enormous set pieces that are way more eye-catching and memorable than anything in Hope County. Great changes, all told. 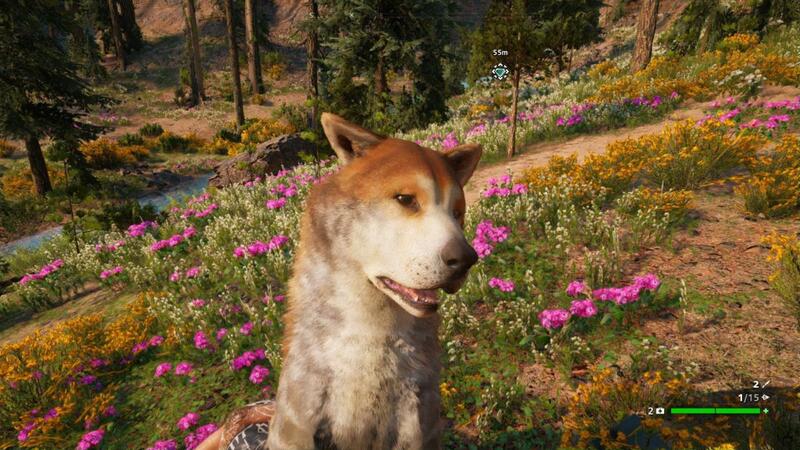 Far Cry: New Dawn is surprisingly satisfying to play, and enticed me to explore outside the bounds of the main story more than its predecessors ever did. Between the Treasure Hunts, the Expeditions, the reworked outposts and weapons systems, a hypothetical Far Cry 6 is working from a solid blueprint. But the stories just aren’t working for me. New Dawn at least feels less irresponsible than its predecessor, if only because its subject matter is less politically charged. Still, there’s no overarching identity here, no cohesion to it. One second you’re listening to a serious sermon about purifying your soul to create a New Eden, the next you’re participating in a demolition derby and fishing a gun out of a poop-filled toilet. It feels like two different games mashed together, and with every new Far Cry outing that tension gets worse.